Apparently I never even got around to posting my April box on Instagram, which is okay because this picture is pretty lackluster, don't you think? The box itself was pretty good though, no real dud to be found. Jouer Tint: This was my sample choice for the month, I think the color I got was "Peony." I've only used this as a lip tin, because I don't really need a strong blush in general, and liquid or creme blushes just don't do well for me. But as a lip color, it's quite nice. The sample size is more than enough to last me, and I think it's a good creamy texture and goes on well. Not something I'll buy at this price, but a good product all the same. LAQA & Co. Sheer Lip Lube Pencil: I am becoming a very big fan of lip pencils/lip crayons. They're so easy to use, and LAQA & Co. makes really good ones. This sheer pencil is fantastic, I really love the hint of color and the consistency of it. I might buy some of their more fun colors like Grape Scotch eventually, though right now I have more lip products than one girl will ever need. Whish Shave Crave Shaving Cream: This one came in their blueberry scent. So one thing about me, I don't use shaving cream. Actually, I hate it. The entire process of trying to shave with any kind of cream makes me cranky because you can't do it easily while the shower is running so you have to take special time to shave and who has that kind of extra time on their hands? Not me. I use a razor with shaving gel bars on it so that I don't have to use shaving cream. So this product, while interesting, is maybe not best targeted to me. I did like it okay, the smell was nice, and it didn't do that excessive foaming lather than I don't really like much either. I'm not sure I can say if it helped me get a closer or smoother shave, honestly I didn't notice a difference. But if I for some reason actually went back to using shaving cream, this is the one I'd pick up. Beaver Professional Hydro Nutritive Moisturizing Shampoo and Repairing Conditioner: So, yet another shampoo and conditioner sample that really didn't seem any more impressive to me than the cheaper grocery store stuff I'm using now. I'm not saying that it's bad, it was perfectly good shampoo, but it's four times the price of what I pay now and I just don't get it. There's got to be something I'm missing about expensive shampoos, some clue that I'm not finding or something. There have been a few where I've seen something and would think about paying more, but most of the time? Nah. Okay, so I'm four months behind right now, but starting to get caught up! Next month will at least be a bit more interesting I think. So I am an acient dinosaur who still has a Netflix DVD account. Primarily because there's a bunch of stuff in my queue that isn't available streaming anywhere so I'm trying to work my way through it. Which is how I ended up with a few odd older films lately, because they've worked their way to the top of my queue and honestly I can't even remember adding them let alone why I did. Though in the case of Princess Raccoon, I actually can remember seeing something about it came out and thinking it looked interesting. Plus I do like Zhang Ziyi quite a bit. So I left it on the list, and then a few weeks ago it finally made it's way to me. Now, one thing that I have to say up front is that while I like foreign movies usually, I am not usually too big of a fan of surreal filmmaking. It's just not my thing. And to be honest, I wish I had paid enough attention before renting the film to know that this was a very surreal and abstract piece in a lot of ways. Really that's the bulk of what my impression of it is, because the storyline is only sort of losely pursued, and it's so very basic and skeletal that there's not all that much to say about it. There's a king who is basically the evil stepmother from Snow White (literally asking who is the fairest and sending someone to kill his son when he discovers his son will soon be the fairest). The twist is instead of asking a magic mirror, he asks a Catholic woman who is probably meant to be a witch or a nun or both, honestly I have no idea. The son of course doesn't die, and ends up falling in love with a woman in the forest who turns out to be Princess Raccoon (actually, she's Tanuki-hime, and a tanuki is not a raccoon, but that's one of those things not worth pursuing a rant about here). Men aren't meant to love raccoons, and so of course there is peril, a quest, somebody dies, somebody doesn't actually die, and so on. Honestly it's a very predictable story if you wrote out what actually happens, the thing is with it being so surreal it's the details that get really weird. "Now the raccoon lady is slapping her stomach to make a gong sound so she can battle the Catholic witch who is throwing paper streamers at her." "I think she was turning into a demon but the magic frog chirped and she put on her lipstick and now she's okay." Did I mention it's a musical? The performances in the film were good, and it was a very well done example of what it is and the type of film it wanted to be. But it was just not at all my thing, and so I don't think I'll be looking for more like this anytime soon. But if you like really, really weird foreign films, give it a try? 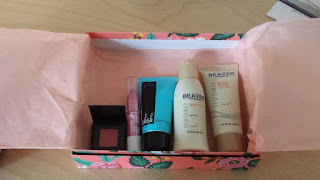 I'm getting so much closer to catching up to my Birchbox reviews! Here's just a few months back in March, which was an interesting and very busy month for me! 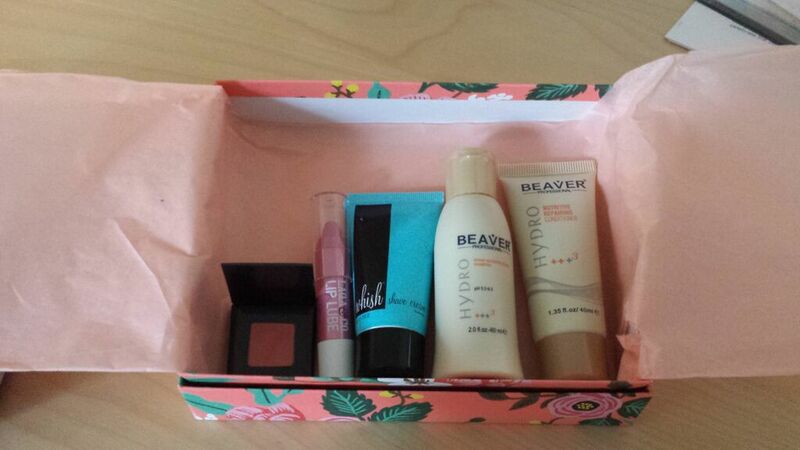 My @birchbox for the month, loving the Fekkai shampoo already, great scent. Temple Spa Peace Be Still Calming Face and Body Balm: This was a nice enough lotion but it was far too thick and far too much to use on my face, like most lotions that aren't oil free, it made me break out. But still good for a body lotion. Jelly Pong Pong Glow Getter Highlighter: The text for this tiny bottle said it offers a "subtle, luminous shimmer" and that is so not true at all. It was a really strong glittery shiny look, and it was far, far too much for anything I ever would do. I thought it was even too severe a sparkle for a night look, let alone something during the every day which is when I usually am wearing makeup. I got rid of it. It's a 10 Miracle Leave-In Product: This was my sample choice, I'd been wanting to try out this product for a while because everybody raves about it so much. It is good, if I'm feeling like I need something strong like a leave-in conditioner. The problem is that I like lighter products more, like Curl Keeper for example, which helps my hair keep it's wavy shape. It's a 10 doesn't really help my curls, actually it probably weighs my hair down just a tad, which just isn't my style normally. That said, I live in D.C. where the humidity is killer, and during this summer it's definitely been a nice way to combat the craziness frizzy mess. Embryoilisses Lai-Creme Concentre (24 Hour Miracle Cream): I was not a fan of this product, first of all it did absolutely nothing as a makeup remover, which is one of the recommended usages. Second, holy cow what a breakout I got after I used this, wow. I ended up disliking it enough to give it away. Fekkai PrX Reparatives Shampoo: I did really love this shampoo, it was really light and wonderful and it helps my hair recover from maybe a little too much cheap conditioner. I am probably going to buy a bottle to swap out with my regular shampoo every few weeks, but it's sadly too expensive for me to use regularly. Yup, in March my movie Good Game officially turned one year old! It's been a crazy ride from anxiously checking my phone for updates on the premiere (I was flying back from Japan and ended up missing the event) to showing at various festivals and conventions, the massive digital release and then finally making DVDs as well. But filmmaking is definitely when I'm at my most creative. And as I write this, another of my short films is about to be released this month! If you're into gaming, you should check out the film. It's available through digital sales and rentals, and also on DVD.